By James Slater: Rest assured Chris Arreola fans. Though “The Nightmare,” has been quiet as of late (after a most active 2011, during which he fought five times), leading some fans to wonder whether the 31-year-old has lost his desire and piled the pounds back on, this couldn’t be further from the truth. This is good news. 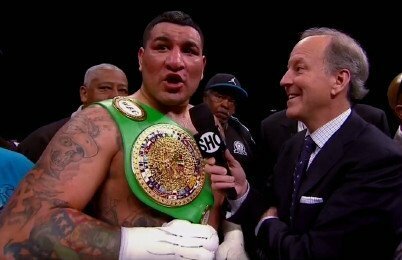 As we know, a dedicated, motivated Arreola is a handful for any heavyweight out there and it would be good to see the WBC#1 ranked heavyweight contender get another fight in before the end of the year. At one point, Arreola, 35-2(30) was very much on Ring Magazine, WBA, IBF and WBO king Wladimir Klitschko’s radar – with “Dr. Steel Hammer” saying he would like to fight in America again and that Arreola was the fighter he had in mind. Instead, Klitschko will next face the largely unknown Mariusz Wach. Would fans have preferred it if Klitschko had signed to fight Arreola in November? No doubt. Hopefully, after Wladimir has taken care of business in Hamburg, and Arreola has removed any ring rust he may or may not have acquired since February, this match-up will go down next year some time. A perfect fight for The Staples Centre in Los Angeles, Klitschko-Arreola is a fight that would, I’m sure, produce action. Arreola was comprehensively bested by older brother Vitali, back in September of 2009, yet he feels his style, his work-rate and pressure, would give Wladimir serious problems. Another possible fight for Arreola, one that has also been spoken of, is a return with Tomasz Adamek, the only other man to have beaten the Mexican/American. The way he looks to be working, staying in shape and hoping to get back in action soon, Arreola might not be too far away from one or both big fights. Along with Eddie Chambers, Arreola has to be looked at as the best, the most experienced U.S heavyweight contender out there today, and six months of inactivity for such an exciting fighter is not a good thing. Arreola could easily have fallen back into old habits during his inactive spell, but “The Nightmare” has resisted any such temptation and is fighting fit. Take that, critics! Previous boxing news: Mike Tyson Vs. Evander Holyfield: Which Fighter Has The Greater Legacy?